First, log in. Then click the "Home" tab on any page and select the "Visit Your Profile" banner. You'll see your writer page. At the top on the right, you'll see a menu with choices in white. Click "Edit Profile." You'll then see a whole new set of choices. Each one will take you to a different part of your writer information, where you'll be able to edit or add items. It's important to fill out all of the screens as fully as you can. Folks are curious about our writers, and they love to know about you. I'm confused by the "Writing Goals" panel. Be sure to read the instructions. They're very helpful. You can select a "Goal Unit" (words written, chapters written, etc.) or make one up and put it in the "Other" box. For an example of what some people are putting in "Other," see Edgar Allan Poe's page. He decided he wanted to write a number of "dark and dreary poems" during the Write-a-Thon. But how many? See the "Goal:" box. This box is meant to contain a number. Poe decided he wanted to write six poems, so he put "6" in the box. 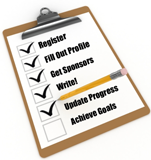 The "Writing Goal" and "Fundraising Goal" boxes are for short statements about your goals. Again, you can see Poe's page for an example. When all the boxes are filled out, you'll get a badge for your Go Grid. My writing goal is 1 Novel. How can I update this to show progress? We can't show your progress in the progress bar if the starting number is 1. It's better to enter the number of chapters you expect to have in your completed novel, or even the number of words. Later, as you enter numbers in the "Add" update box, you'll be entering the number of chapters or words you've written since the last update. Again, take a look at Edgar Allan Poe's progress bar. He has finished two poems. I entered the wrong number in my "Add" box. How can I fix this? It's possible to enter a negative number in the box. Say you entered a "2" and you meant to enter a "3." First, enter "-2" and click "Update." That puts you back where you were before you made the error. Now enter "3," click "Update" again, and you're all set. If you're still having trouble, email webmaster@theclarionfoundation.org. I can't see my "Excerpts" or "Publications." Click on the two blue boxes near the bottom of your page to show or hide your excerpts and publications. How can I create or join a team? Once you have donated $20 to other writers or have received $20 in donations (as opposed to pledges), you'll have the opportunity to join or create a team of Write-a-Thon writers, be listed as a Team Player in the Writer Teams area of the web site and on your writer page, and earn a special badge for your grid. The team can choose a name and appoint a moderator who may post team progress reports on the Clarion Blog. We've also set up a special area on the Clarion Message Board where Team Players can post writing questions and answers, cheer each other on, and provide general support for one another. Click here for more information about forming or joining a team. Why do you have the $20 rule for joining a team? In order to join a team, be listed as a team member on the website, and earn a "Team Member" badge, you'll need a minimum of $20 in donations -- either to you or from you. Pledges don't work for this purpose. 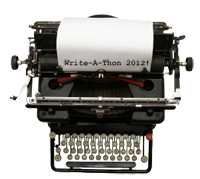 The Write-a-Thon is mainly about providing a summer's worth of motivation for all interested writers. But it's also about raising funds to keep the Clarion Workshop going. We keep our end of this bargain by setting up the web site and providing fun features, weekly writing challenges, prizes, and a public space for participants. The basic team donation is an incentive to help writers keep their end of the bargain, too. 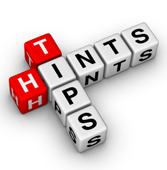 You'll find other helpful tips on the Tips for Writers page.